Burkitt lymphoma is a cancer of the lymphatic system, particularly B lymphocytes found in the germinal center. It is named after Denis Parsons Burkitt, a surgeon who first described the disease in 1958 while working in equatorial Africa. The overall cure rate for Burkitt's lymphoma in developed countries is about 90%, but worse in low-income countries. Burkitt's lymphoma is uncommon in adults, where it has a worse prognosis. Seven-year-old Nigerian boy with a several-month history of jaw swelling which had been treated with antibiotics: The tumor was ulcerated and draining. Currently, Burkitt lymphoma can be divided into three main clinical variants: the endemic, the sporadic, and the immunodeficiency-associated variants. The endemic variant (also called "African variant") most commonly occurs in children living in malaria endemic regions of the world (e.g., equatorial Africa, Brazil, and Papua New Guinea). Epstein-Barr virus (EBV) infection is found in nearly all patients. Chronic malaria is believed to reduce resistance to EBV, allowing it to take hold. The disease characteristically involves the jaw or other facial bone, distal ileum, cecum, ovaries, kidney, or breast. The sporadic type of Burkitt lymphoma (also known as "non-African") is the most common variant found in places where malaria is not holoendemic. The tumor cells have a similar appearance to the cancer cells of classical endemic Burkitt lymphoma. Sporadic lymphomas are rarely associated with the Epstein–Barr virus. Non-Hodgkin lymphoma, which includes Burkitt's, accounts for 30–50% of childhood lymphoma. The jaw is less commonly involved, compared to the endemic variant. The ileocecal region is the common site of involvement. Immunodeficiency-associated Burkitt lymphoma is usually associated with HIV infection or occurs in the setting of post-transplant patients who are taking immunosuppressive drugs. Burkitt lymphoma can be one of the diseases associated with the initial manifestation of AIDS. By morphology (i.e., microscopic appearance) or immunophenotype, it is almost impossible to differentiate these three clinical variants. Immunodeficiency-associated Burkitt lymphoma may demonstrate more plasmacytic appearance or more pleomorphism, but these features are not specific. Burkitt's lymphoma is commonly associated with the infection of B cell lymphocytes with the Epstein-Barr virus (EBV) and in these cases in considerer to be one form of the Epstein-Barr virus-associated lymphoproliferative diseases. The epidemic variant of Burkitt's lymphoma (eBL) is in almost all cases associated with EBV infection. However, the sporadic variant, which afflicts ~1,200 individuals/year in the USA, is associated with the virus in only 10-15% of cases. The immunodeficiency-associated variant of Burkitt's lymphoma strikes 30-40% of individuals with HIV-induced AIDS and rare cases of patients who received a bone marrow or other organ transplant; in the latter cases, individuals have almost always received intensive chemotherapy and therefore are immunodeficient. About 30% of individuals with the immunodeficiency variant are infected with EBV. The fact that some Burkitt's lymphoma cases do not involve EBV allows that many cases of the disease are not caused and/or promoted by EBV, i.e. the virus may be an innocent passenger virus in these cases. However, the almost ubiquitous presence of the virus in the epidemic variant of Burkitt's lymphoma suggests that it contributes to the development and/or progression of this variant. The mutational landscape in BL has recently been found to differ between tumors with and without EBV infection, further strengthening the role of the virus in lymphomagenesis. Burkitt's lymphoma in a kidney biopsy. High-power view of Burkitt's lymphoma with "starry sky" appearance. H&E stain. All types of Burkitt lymphoma are characterized by dysregulation of the c-myc gene by one of three chromosomal translocations. This gene is found at 8q24. The most common variant is t(8;14)(q24;q32), which accounts for about 85% of cases. This involves c-myc and IGH@. A variant of this, a three-way translocation, t(8;14;18), has also been identified. A rare variant is at t(2;8)(p12;q24). This involves IGK@ and c-myc. Another rare variant is t(8;22)(q24;q11). This involves IGL@ and c-myc. Combined, the two less-common translocations, t(2;8)(p12;q24) and t(8;22)(q24;q11), account for the remaining 15% of cases not due to the t(8;14)(q24;q32) translocation. In 2014, it was described that short non-coding RNAs named microRNAs (miRNAs) have important functions in lymphoma biology. In malignant B cells, miRNAs participate in pathways fundamental to B cell development, like B cell receptor (BCR) signalling, B cell migration/adhesion, cell-cell interactions in immune niches, and the production and class-switching of immunoglobulins. Normal B cells of a germinal center possess rearranged immunoglobulin heavy and light chain genes, and each isolated B cell possesses a unique IgH gene rearrangement. Since Burkitt lymphoma and other B-cell lymphomas are a clonal proliferative process, all tumor cells from one patient are supposed to possess identical IgH genes. When the DNA of tumor cells is analyzed using electrophoresis, a clonal band can be demonstrated, since identical IgH genes will move to the same position. On the contrary, when a normal or reactive lymph node is analyzed using the same technique, a smear rather than a distinct band will be seen. This technique is useful since sometimes benign reactive processes (e.g. 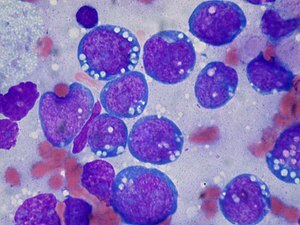 infectious mononucleosis) and malignant lymphoma can be difficult to distinguish. The tumor consists of sheets of a monotonous (i.e., similar in size and morphology) population of medium-sized lymphoid cells with high proliferative and apoptotic activity. The "starry sky" appearance seen under low power is due to scattered tingible body-laden macrophages (macrophages containing dead apoptotic tumor cells). The old descriptive term of "small non-cleaved cell" is misleading. The tumor cells are mostly medium in size (i.e., tumor nuclei size similar to that of histiocytes or endothelial cells). "Small non-cleaved cells" are compared to "large non-cleaved cells" of normal germinal center lymphocytes. Tumor cells possess small amounts of basophilic cytoplasm with three to four small nucleoli. The cellular outline usually appears squared off. The tumor cells in Burkitt lymphoma generally strongly express markers of B cell differentiation (CD20, CD22, CD19), as well as CD10 and BCL6. The tumor cells are generally negative for BCL2 and TdT. The high mitotic activity of Burkitt lymphoma is confirmed by nearly 100% of the cells staining positive for Ki67. In general, the first line of treatment for Burkitt's lymphoma is intensive chemotherapy. A few of these regimens are: the GMALL-B-ALL/NHL2002 protocol, the modified Magrath regimen (R-CODOX-M/IVAC). COPADM, hyper-CVAD, and the Cancer and Leukemia Group B (CALGB) 8811 regimen; these can be associated with rituximab. In older patients treatment may be dose-adjusted EPOCH with rituximab. The effects of the chemotherapy, as with all cancers, depend on the time of diagnosis. With faster-growing cancers, such as Burkitt's, the cancer actually responds faster than with slower-growing cancers. This rapid response to chemotherapy can be hazardous to the patient, as a phenomenon called "tumor lysis syndrome" could occur. Close monitoring of the patient and adequate hydration is essential during the process. Since Burkitts lymphoma has high propensity to spread to the central nervous system (lymphomatous meningitis), intrathecal chemotherapy with methotrexate and/or ARA-C and/or prednisolone is given alongside with systemic chemotherapy. Other treatments for Burkitt's lymphoma include immunotherapy, bone marrow transplants, stem cell transplant, surgery to remove the tumor, and radiotherapy. The overall cure rate for Burkitt's lymphoma in developed countries is about 90%, but worse in low-income countries. Burkitt's lymphoma is uncommon in adults, where it has a worse prognosis. In 2006, treatment with dose-adjusted EPOCH with Rituximab showed promising initial results in a small series of patients (n=17), with a 100% response rate, and 100% overall survival and progression-free survival at 28 months (median follow-up). Of all cancers involving the same class of blood cell, 2.3% of cases are Burkitt lymphoma. Epstein-Barr virus infection is strongly correlated with this cancer. Unique genetic alterations promote cell survival in Burkitt lymphoma, distinct from other types of lymphoma. These TCF3 and ID3 gene mutations in Burkitt correspond to a cell survival pathway that may be found to be amenable to targeted therapy. ^ synd/2511 at Who Named It? ^ Burkitt D (1958). "A sarcoma involving the jaws in African children". The British Journal of Surgery. 46 (197): 218–23. doi:10.1002/bjs.18004619704. PMID 13628987. ^ a b c d e Molyneux E, Rochford R, Griffin B, Newton R, Jackson G, Menon G, Harrison C, Israels T, Bailey S (April 2012). "Burkitt's lymphoma". The Lancet. 379 (9822): 1234–1244. doi:10.1016/S0140-6736(11)61177-X. PMID 22333947. ^ Dojcinov, SD; Fend, F; Quintanilla-Martinez, L (7 March 2018). "EBV-Positive Lymphoproliferations of B- T- and NK-Cell Derivation in Non-Immunocompromised Hosts". Pathogens (Basel, Switzerland). 7 (1). doi:10.3390/pathogens7010028. PMC 5874754. PMID 29518976. ^ Brady G, MacArthur GJ, Farrell PJ (December 2007). "Epstein–Barr virus and Burkitt lymphoma". Journal of Clinical Pathology. 60 (12): 1397–1402. doi:10.1136/jcp.2007.047977. PMC 2095571. PMID 18042696. ^ Bellan C, Lazzi S, De Falco G, Nyongo A, Giordano A, Leoncini L (March 2003). "Burkitt's lymphoma: new insights into molecular pathogenesis". J. Clin. Pathol. 56 (3): 188–92. doi:10.1136/jcp.56.3.188. PMC 1769902. PMID 12610094. ^ a b Casulo C, Friedberg J (September 2015). "Treating Burkitt Lymphoma in Adults". Current Hematologic Malignancy Reports. 10 (3): 266–71. doi:10.1007/s11899-015-0263-4. PMID 26013028. ^ Vockerodt M, Yap LF, Shannon-Lowe C, Curley H, Wei W, Vrzalikova K, Murray PG (January 2015). "The Epstein-Barr virus and the pathogenesis of lymphoma". The Journal of Pathology. 235 (2): 312–22. doi:10.1002/path.4459. PMID 25294567. ^ Dojcinov SD, Fend F, Quintanilla-Martinez L (March 2018). "EBV-Positive Lymphoproliferations of B- T- and NK-Cell Derivation in Non-Immunocompromised Hosts". Pathogens (Basel, Switzerland). 7 (1). doi:10.3390/pathogens7010028. PMC 5874754. PMID 29518976. ^ Navari M, Etebari M, De Falco G, Ambrosio MR, Gibellini D, Leoncini L, Piccaluga PP (2015). "The presence of Epstein-Barr virus significantly impacts the transcriptional profile in immunodeficiency-associated Burkitt lymphoma". Frontiers in Microbiology. 6: 556. doi:10.3389/fmicb.2015.00556. PMC 4462103. PMID 26113842. ^ Grande, Bruno M.; Gerhard, Daniela S.; Jiang, Aixiang; Griner, Nicholas B.; Abramson, Jeremy S.; Alexander, Thomas B.; Allen, Hilary; Ayers, Leona W.; Bethony, Jeffrey M.; Bhatia, Kishor; Bowen, Jay; Casper, Corey; Choi, John Kim; Culibrk, Luka; Davidsen, Tanja M.; Dyer, Maureen A.; Gastier-Foster, Julie M.; Gesuwan, Patee; Greiner, Timothy C.; Gross, Thomas G.; Hanf, Benjamin; Harris, Nancy Lee; He, Yiwen; Irvin, John D.; Jaffe, Elaine S.; Jones, Steven J. M.; Kerchan, Patrick; Knoetze, Nicole; Leal, Fabio E.; Lichtenberg, Tara M.; Ma, Yussanne; Martin, Jean Paul; Martin, Marie-Reine; Mbulaiteye, Sam M.; Mullighan, Charles G.; Mungall, Andrew J.; Namirembe, Constance; Novik, Karen; Noy, Ariela; Ogwang, Martin D.; Omoding, Abraham; Orem, Jackson; Reynolds, Steven J.; Rushton, Christopher K.; Sandlund, John T.; Schmitz, Roland; Taylor, Cynthia; Wilson, Wyndham H.; Wright, George W.; Zhao, Eric Y.; Marra, Marco A.; Morin, Ryan D.; Staudt, Louis M. (21 March 2019). "Genome-wide discovery of somatic coding and noncoding mutations in pediatric endemic and sporadic Burkitt lymphoma". Blood. 133 (12): 1313–1324. doi:10.1182/blood-2018-09-871418. ^ a b c Hoffman, Ronald (2009). Hematology : basic principles and practice (PDF) (5th ed.). Philadelphia, PA: Churchill Livingstone/Elsevier. pp. 1304–1305. ISBN 978-0-443-06715-0. ^ Liu D, Shimonov J, Primanneni S, Lai Y, Ahmed T, Seiter K (2007). "t(8;14;18): a 3-way chromosome translocation in two patients with Burkitt's lymphoma/leukemia". Mol. Cancer. 6 (1): 35. doi:10.1186/1476-4598-6-35. PMC 1904237. PMID 17547754. ^ a b Smardova J, Grochova D, Fabian P, et al. (October 2008). "An unusual p53 mutation detected in Burkitt's lymphoma: 30 bp duplication". Oncol. Rep. 20 (4): 773–8. doi:10.3892/or_00000073. PMID 18813817. ^ Fujita S, Buziba N, Kumatori A, Senba M, Yamaguchi A, Toriyama K (May 2004). "Early stage of Epstein–Barr virus lytic infection leading to the "starry sky" pattern formation in endemic Burkitt lymphoma". Arch. Pathol. Lab. Med. 128 (5): 549–52. doi:10.1043/1543-2165(2004)128<549:ESOEVL>2.0.CO;2. PMID 15086279. ^ Steven H Swerdlow (2008). WHO classification of tumours of haematopoietic and lymphoid tissues. World Health Organization classification of tumours. Lyon, France : International Agency for Research on Cancer. ISBN 978-92-832-2431-0. ^ Barnes, J.A. ; LaCasce2, A.S; Feng, Y.; et al. (2011). "Evaluation of the addition of rituximab to CODOX-M/ IVAC for Burkitt's lymphoma: a retrospective analysis" (pdf). Annals of Oncology. 22.8: 1859–64. doi:10.1093/annonc/mdq677. ^ "Risk factors and treatment of childhood and adolescent Burkitt lymphoma/leukaemia". British Journal of Haematology. 156: 730–743. doi:10.1111/j.1365-2141.2011.09024.x. ^ a b c "Burkitt Lymphoma and Burkitt-like Lymphoma: Practice Essentials, Background, Etiology and Pathophysiology". 29 June 2017. Retrieved 19 March 2018 – via eMedicine. ^ Wyndham H. Wilson; Kieron Dunleavy; Stefania Pittaluga; Upendra Hegde; Nicole Grant; Seth M. Steinberg; Mark Raffeld; Martin Gutierrez; Bruce A. Chabner; Louis Staudt; Elaine S. Jaffe; John E. Janik (2008). "Phase II Study of Dose-Adjusted EPOCH-Rituximab in Untreated Diffuse Large B-cell Lymphoma with Analysis of Germinal Center and Post-Germinal Center Biomarkers". Journal of Clinical Oncology. 26 (16): 2717–2724. doi:10.1200/JCO.2007.13.1391. PMC 2409217. PMID 18378569. ^ Yustein JT, Dang CV (2007). "Biology and treatment of Burkitt's lymphoma". Curr. Opin. Hematol. 14 (4): 375–81. doi:10.1097/MOH.0b013e3281bccdee. PMID 17534164. ^ Dunleavy, Kieron; Pittaluga, Stefania; Janik, John; Grant, Nicole; Shovlin, Margaret; Little, Richard; Yarchoan, Robert; Steinberg, Seth; Jaffe, Elaine S.; Wilson, Wyndham H. (16 November 2006). "Novel Treatment of Burkitt Lymphoma with Dose-Adjusted EPOCH-Rituximab: Preliminary Results Showing Excellent Outcome". Blood. 108 (11): 2736–2736. Retrieved 19 March 2018 – via www.bloodjournal.org. ^ Pannone, Giuseppe; Zamparese, Rosanna; Pace, Mirella; Pedicillo, Maria; Cagiano, Simona; Somma, Pasquale; Errico, Maria; Donofrio, Vittoria; Franco, Renato; De Chiara, Annarosaria; Aquino, Gabriella; Bucci, Paolo; Bucci, Eduardo; Santoro, Angela; Bufo, Pantaleo (2014). "The role of EBV in the pathogenesis of Burkitt's Lymphoma: an Italian hospital based survey". Infectious Agents and Cancer. 9 (1): 34. doi:10.1186/1750-9378-9-34. ISSN 1750-9378. ^ "NIH study shows Burkitt lymphoma is molecularly distinct from other lymphomas". National Cancer Institute. ^ Staudt L; et al. (2012). "Burkitt Lymphoma Pathogenesis and Therapeutic Targets from Structural and Functional Genomics". Nature. 490: 116–120. doi:10.1038/nature11378. Wikimedia Commons has media related to Burkitt's lymphoma.